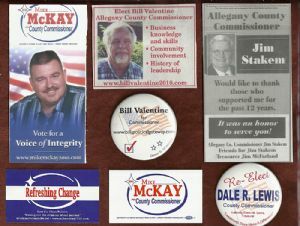 Mike McKay, a Republican, is a candidate for the office of Allegany County Commissioner in 2010. A local businessman and dry cleaner who promises a "Refreshing Change", he has as his campaign motto, "Vote for Clean Politics", with the slogan, "Ironing out the wrinkles of old policies". McKay won in the September primary and on November 2, 2010 was the General Election's top vote-getter in a Republican sweep of the three member Board of Allegany County Commissioners. McKay chose not to run for re-election for County Commissioner in 2014, but instead ran for and was elected to the Maryland House of Delegates, District 1-C. McKay was re-elected in 2018. Bill Valentine, a Republican, won in the September 2010 primary and was also successful in his bid for Allegany County Commissioner in the November 2010 General Election. Business experience, leadership, and community involvement were among the qualifications he presented. Valentine was re-elected to the Board of Allegany County Commissioners in 2014. Valentine was defeated in his bid for re-election in 2018. James J. Stakem, a Democrat, was first elected to the Board of Allegany County Commissioners in 1998. He was re-elected to a second four-year term in 2002, and was re-elected a third time in 2006. The door hanger depicted here, with his slogan, "A True Representative for All of Allegany County" is from that campaign. Stakem's campaign treasurer was Phil Davis. Jim Stakem lost his bid for re-election to County Commissioner in the September 14, 2010 Democratic primary. Dale R. Lewis, a Republican, was first elected to the Allegany County Board of Education in 1980. He was re-elected in 1984, lost in 1988, and was re-elected in 1990 and again in 1992. He was elected to the Board of Allegany County Commissioners in 1994, and re-elected to that office in 1998. Lewis lost his re-election bid in 2002, but was voted in as Allegany County Commissioner in 2006. Lewis has also been elected to about four or five terms on the Allegany County Republican Central Committee. His 2010 re-election campaign button for County Commissioner depicted on this page depicts the slogan "Leadership Does Make a Difference", and was produced by authority of his campaign treasurer, Eileen Lewis. He lost his bid for re-election to County Commissioner in the September 2010 Republican primary.